Armin van Buuren recently celebrated the 700th episode of his weekly radio show ‘A State of Trance’, where he handed over control to his fans. This week, Armin will start a new tour called “Together in A State of Trance”, a theme that has been chosen to involve the fans as much as possible in the tour. The tour will take the ‘A State Of Trance Festival’ to continents around the globe and in doing so, Armin van Buuren will apparently become the first DJ to have his own festival. On 21 February, Armin will host his only European A State of Trance Festival, organised at the Jaarbeurs in Utrecht. The show will be followed on 11 April by a show in Buenos Aires. The brand will also have an internship during Ultra Music Festival in Miami 0n 29 March. 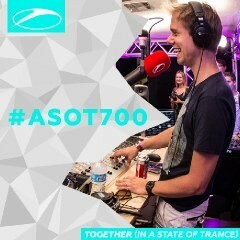 For the tour, he has created a theme track called ‘Together (In A State Of Trance)’. Along with six remixes, it will be available via all music download and streaming services and physically on CD.